Back from a much-needed vacation in Taiwan. Every year I come back with a lot of things to process. And these past few days I’ve been processing though the fog of jet lag. Like what a blessed life we have here with a view of a park out of our back window. And clean air. A reminder to not complain about the silly, perceived inconveniences of our lives. 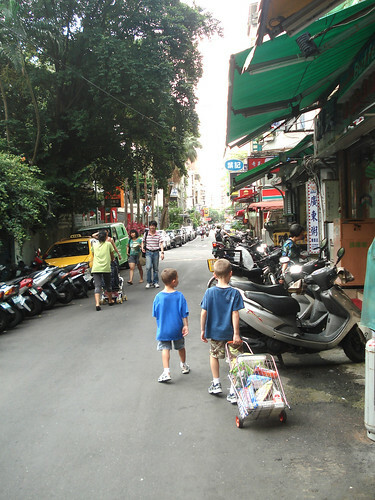 I was showing our family some things that we brought back and my niece, who went with us to Taipei last year commented, “Everything’s cute in Taiwan.” I’m sure she wasn’t talking about the traffic and pollution, but it made me smile to think that that is the impression that she had because I love Taiwan. And in spite of the smaller living spaces and difficulty we had getting our laundry dry in the washer/dryer combo we had, I hope I never give off a negative impression of the country I grew up in. Without a car we walked. A lot. Walked to the subway. Walked to the bus. Carted our groceries in our hands. Hiked numerous mountains. And I felt my body shed some of its winter “padding”. 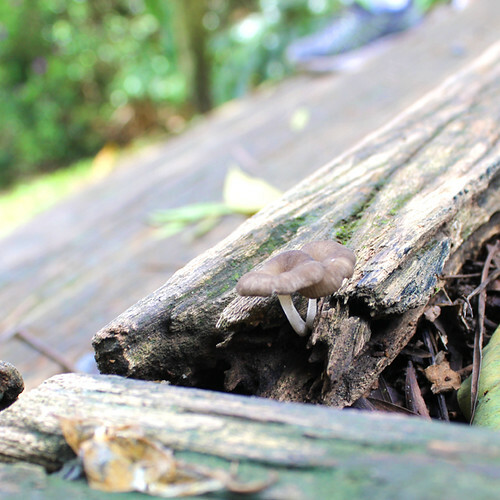 And I discovered I like to photograph mushrooms. And Sensei Wu traveled with us. He’ll make his appearance here soon. 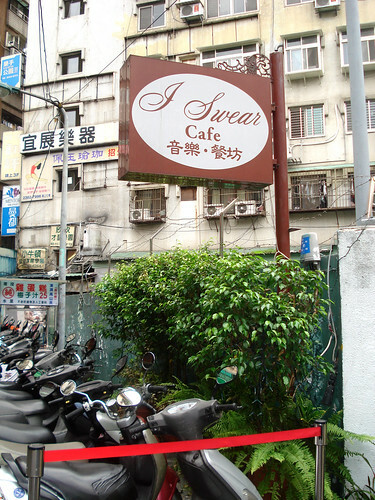 Taipei has many, many signs – most of which are relatively normal. But every once in a while I’ll come across one that just cracks me up. Usually there is absolutely nothing wrong with it, but it is so out of the ordinary for me that it makes me laugh. Below are a few of those. 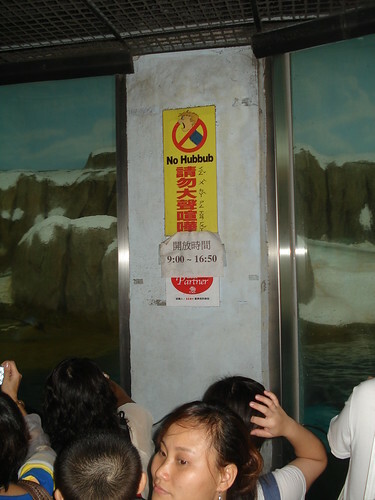 Taken at the penguin exhibit at the Taipei Zoo. They want us to be quiet. 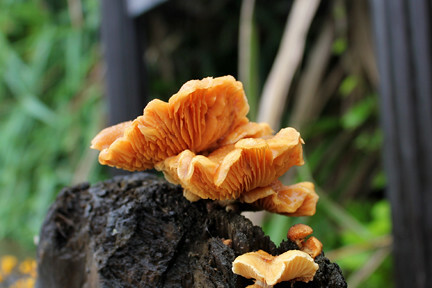 Also from the Taipei Zoo. 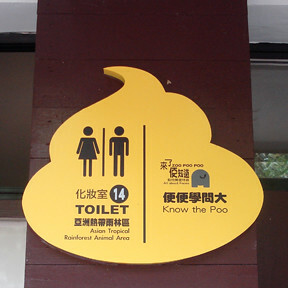 There is a “Know the Poo” exhibit in the bathroom area that shows the different sizes of poo of different zoo animals. It seems highly unlikely that an exhibit like that would be approved of in a US zoo, but I’m not sure why. There’s nothing wrong with it, right? Again, nothing wrong with this sign. 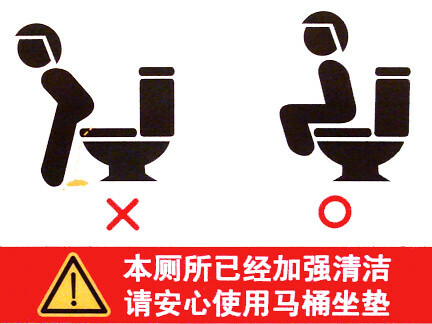 Taken in the women’s restroom on the observation deck of Taipei 101, the world’s 2nd tallest building. Message: Women, please don’t hover and make a mess. Thanks. 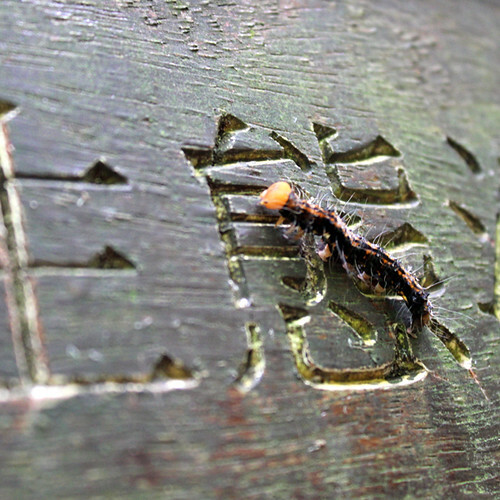 Taken at the enterance to Dahu park in Neihu district, Taipei. Again, a perfectly fine message, right? But this one really cracks me up! 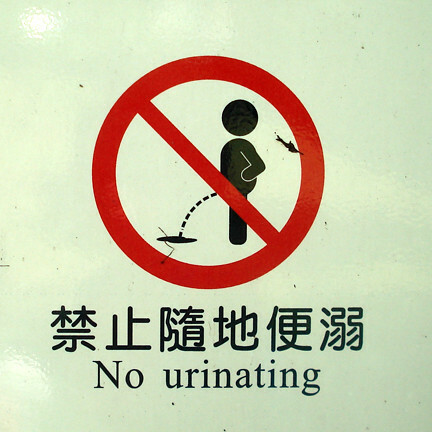 I, for one, am glad that the urinating man is standing right where he is. 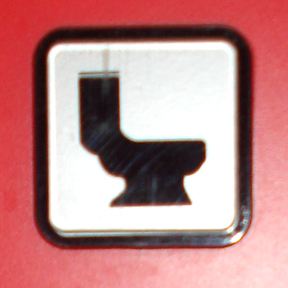 Apparently potty humor makes me laugh. Sorry to those of you out there who don’t find it amusing. 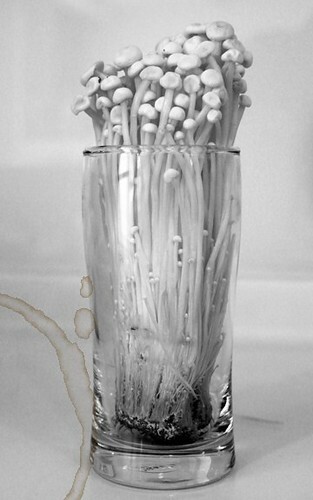 I’ll be back to crafty posts in about a month. If so, you’re in luck! If not, then prepare yourself for a potty-going adventure! 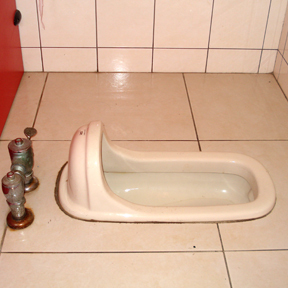 I don’t have any tips for you except this (and I only mention this because I was told that some people didn’t know): You do NOT need to take off all your bottom-covering clothes (which would also involve your shoes – blech, blech, BLECH!). You should find success by getting them down to your knees. 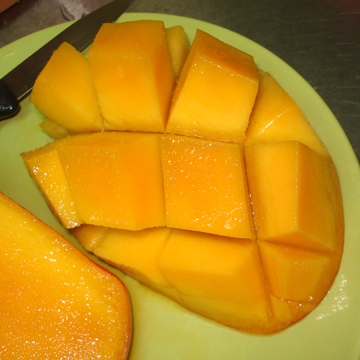 I was thrilled to get to eat some yummy mangos after we got here. 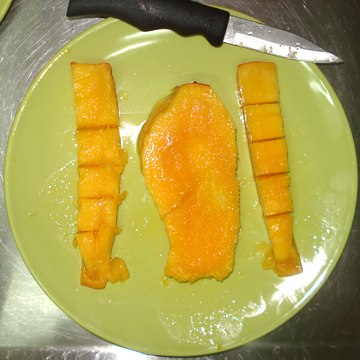 It reminded me that I had wanted to do a post on how to easily cut a mango. This is how my parents did it for me when I was growing up. 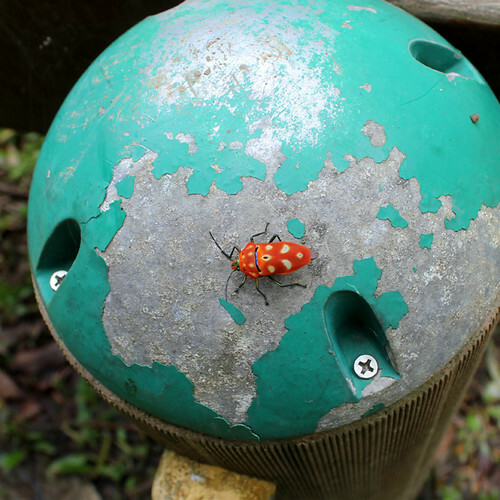 1) Determine the direction of the seed. 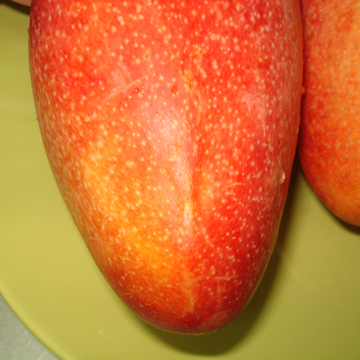 A mango seed is a large, flat oval. Knowing which way the seed is going is important before cutting and sometimes difficult to determine. 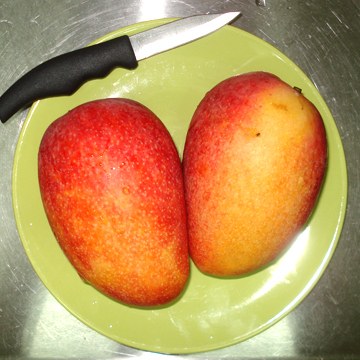 What you may not know is that every mango has a belly button (very technical name, don’t you think?). 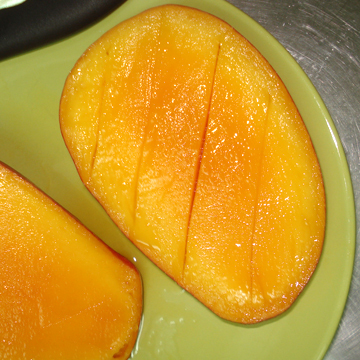 It is on the bottom half of the mango. On the mangos that I’ve had in TX (grown in Mexico, I think) the belly button is really obvious. On the ones below from the Phillipines (I think), it’s a bit harder to see. Either way, it will look like a little bump or distortion in the smooth skin. Follow the line from the belly button to the stem of the mango. This line is follows the edge of the seed. You will want to cut parallel to this line. 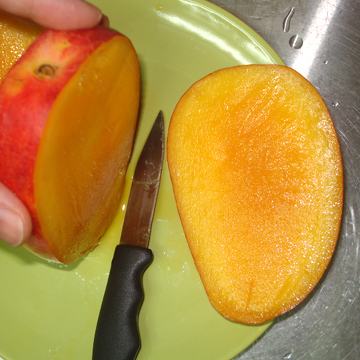 2) Cut both sides of the mango off. 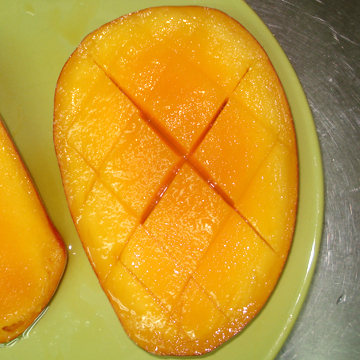 3) Cut diagonal lines into the meat of the mango. 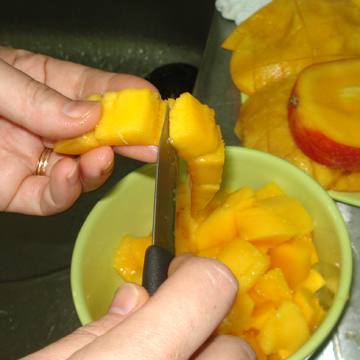 If you are gutsy and decide to cup the mango in your hand, then be careful not to cut through the skin and into your palm. 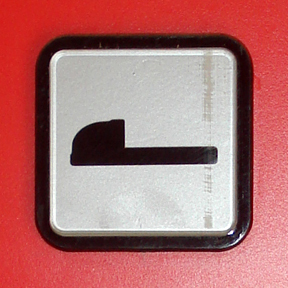 Turn the piece and cut again. I like to make diamonds rather than squares, but only because I have this thing for argyle. 4) THE funnest (yes, it’s a word) step. 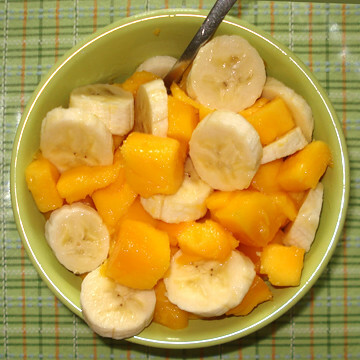 With your thumbs on top and fingers underneath, push up on the skin until the mango cup turns inside out. The chunks will pop up out of the skin. You can now cut the chunks off into a bowl OR if you’re gutsy you can hand them to your kids so they can bite them off of the skin possibly squirting juice all over their cubby cheeks, hands and shirts. Yes, this is what happens in my family. but you can still get some cubes off of it by making some short cuts and cutting the cubes off. 7) Actually, this is the messiest part (but it’s optional). There is so much juicy goodness on the seed. Please don’t toss it just yet. Cut some more meat off, or better yet, if the kids aren’t watching, lean over the kitchen sink and gnaw all that yumminess off. You won’t regret it as long as you have some dental floss handy to get the pulp out of your teeth. It’s truly a deliciously juicy delight, don’t you think? I have this memory from when my sister and I were kids. We used to play in the street in front of our house and when a car would turn onto the street we’d move out of the way. At some point we turned this into a game (Mom, I’m quite sure we never told you about this part). We would dare eachother to touch the car as it drove by. I remember the thrill of getting my fingers on the moving car or if I was really gutsy, putting my foot up and touching the car with my shoe. Yes, it’s a stupid and crazy dangerous game for kids to be playing. Thankfully we were never hurt. 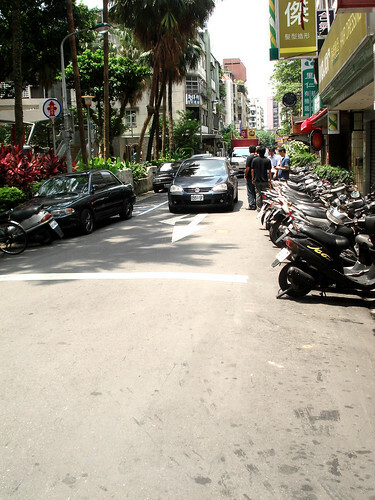 Here is a similar street with a car driving down it. See how close those people are to the moving car and how unphased they are? C’mon, touch the car – just stick your foot out and touch it. I dare you! A big lesson my kids are learning on this trip is how to dodge traffic. For the most part it hasn’t been too dangerous, but it’s enough to make a mom worry about her American kids. And you want to see an amazing parking job? 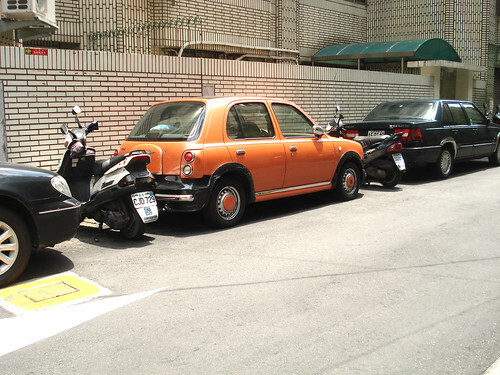 I’m pretty sure the motorcycles parked after the Cooper was parked, but still, imagine getting out of a spot like this. Remember how hard it was to come up with a blog name? (To those of you who didn’t have a hard time, I’m jealous.) Now let’s say you’d like to have your blog name in another language, like Russian, just to give your blog a little more character. Here’s some advice: find a reliable native speaker of the language to help you capture the feel of what you want your blog to say. Now let’s say you have a plain banner with your blog name in English and Russian (a name that you just found using Babelfish) and you decide that you want a graphic to put beside the name to capture the feel of what you want your blog to look like. You think, “I want a romantic feel.” and you google “romantic images” and slap on a picture that shows up. Hmm…. advice #2: hire a good graphic designer than can capture that feel for you. And here they are again, neglecting advice #2. The funny thing is that if I were the coffee-shop-going type, I just might go to this coffee shop in spite of the name. 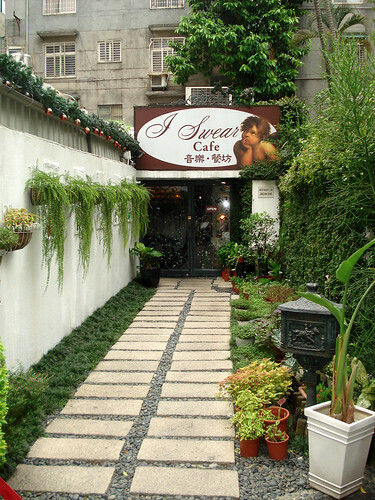 I’ve found many coffee shops in Taiwan to be unique and fun to go to with nice little appetizers and delicious drinks. And you can tell by the entrance landscaping that the owner of this one really cares about his business. We are enjoying our time here. I had forgotten how incredibly tired I can get when jetlagging.